I’ve written about spinnerbaits in the past. 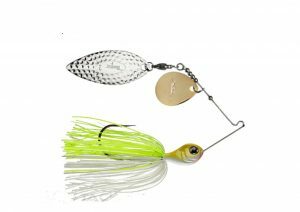 They’re one of several older, super good lures that have fallen out of favor because other baits have come along that are newer and more popular. That’s too bad because they serve a serious purpose. I never leave the dock without a handful of them in my boat, and within that handful will almost always be a few giants. Before we get too far into this thing, though, we need to define giant. I’m talking about something in the No. 5,6,7 or even No. 8 range. I want lots and lots of flash and a serious amount of thump when I wind it back to the boat. What I don’t mean by giant is heavy. Most of the time I’m throwing a 1/2-ounce or a 3/4-ounce head. Almost never do I go above a full ounce. This isn’t about weight. It’s about creating a huge profile when the bass sees my lure. My choice of spinnerbaits is always a Molix Venator, at least when I’m going giant. They’re well built, reasonably priced and can be modified quickly. The modification thing is really important. You only need four or five bodies and a box of blades to make dozens of different looking lures. I usually put a big willow leaf blade behind and a smaller Colorado up front. It’s no secret that big baits attract big bass. 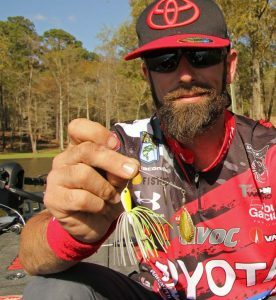 I know nearly every angler can tell a story about a big bass that bit a tiny lure. Most of them will be true. Nevertheless, if you want to catch big bass, I suggest you throw big baits. Bass are primarily sight feeders but their lateral line is important, too. 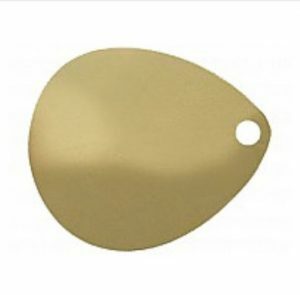 The bright flash from a huge blade and the hard thump that accompanies that flash makes it much easier for the bass to find your lure and attack it. Hint: Sometimes replacing a big willow leaf blade with a big Colorado helps when the water’s really nasty. Don’t believe all the nonsense you hear about smallmouth being partial to small forage and small lures. It isn’t true, at least not for the ones in the 5 and 6 pound class. They’ll grab something big before they even look towards something small. Most of the time, though, I downsize my big blade to a No 5 when I’m hunting big smallies. Another thing to keep in mind about big smallmouth is that they are partial to shock colors. I often throw pink, orange and almost any hue of fluorescent. If you don’t believe me, give them a try. Fish giant spinnerbaits, especially if you’re looking for giant bass.